This Web Exclusive comes from Anchor Audio Inc. In an effort to squeeze maximum utility out of minimal equipment outlay, budget-conscious schools, hotels, churches, and other facilities are increasingly turning to the portable public address system as an answer to the high cost of installing a fixed system in every room where sound or music might be required. 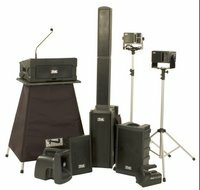 This trend toward opting for a mobile PA system that most anyone can quickly set up and use can yield savings over the limitations imposed by a fixed system. An outdoor amphitheater might require a sound system, another might be required in the auditorium, and yet another might be required in the gym. Further, classrooms and conference rooms have ever-increasing requirements for sound equipment. Permanent, installed sound systems for each of these locations would be cost prohibitive for most institutions; however, one or two shared portable systems could provide a solution at an affordable price. In recent years, portable sound system technology has evolved to provide a serious alternative to installed sound systems. In many cases, a portable system will actually deliver clearer sound than an installed system because all of the components are designed to work together as a package. The amplifier, mixer, microphones and speakers are factory engineered to work together without distortion. In a permanent installation, the professional sound contractor attempts to achieve this balance of components with varying degrees of success. Dave Johnson, acount executive with Troxell Communications, adds, “For a larger venue such as an auditorium, a portable system would run around $2,000 and a permanent system would be $13,000 and up,” he says. The portable systems also carry another advantage for most users – there’s no installation involved. “We can almost direct-ship them to teachers and they or school personnel can easily set them up,” says Vyne. Portable sound systems provide an economical, flexible, reliable and easy-to-use alternative to installed sound system. They are becoming the product of choice for high quality public address in the institutional marketplace. Looking For HVAC Zone Control?To satisfy energy efficiency and occupant demands, variable refrigerant flow systems may deliver on facility management needs. New LCS WiFi Lighting Control System From VistaThe low-profile, lightweight, cloud-based, multi-zone WiFi lighting controller can be managed from a mobile device regardless of location via a free, downloadable app. Next articleGlobal Green/Brad Pitt Green Design Competition Winners Announced TODAY!